This week on The Song Revolution Podcast, I had the very fun opportunity to interview global worship leader and songwriter, Chris McClarney. Chris got his start at 14-years old here in Nashville leading worship for his youth group and was encouraged by his mentors, Travis Cottrell and Benji Cowart, both fine worship leaders and songwriters, as well. In this episode, Chris and I talked about what it’s like to hear thousands of people singing your songs and the joy it brings, all the while guarding your heart from pride and the sin of comparison. I’ve never laughed on a podcast as much as I did on this one and Chris is a delightful guy to hang out with. I invite you to check it out and to go listen through Chris’ great new album he has been touring with Jesus Culture called Breakthrough. Ready to take bold action to fulfill your songwriting call? The next NCS Boot Camp begins November 12th! 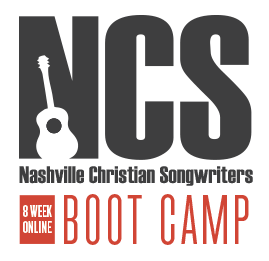 The NCS Boot Camp is an eight-week ONLINE mentoring and coaching experience led by NCS Managing Partner, John Chisum, an industry leader and veteran with over 400 songs recorded in his career. Read more here and apply today! Thank you. This really blessed me. I have felt like God might want me to start something. Don’t know details of how or when or where, but what you said encouraged me. Thanks.